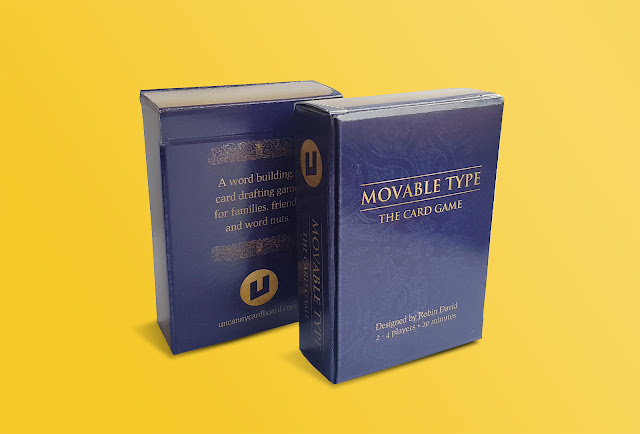 Movable Type (formerly Litterateur) is a word-building card-drafting game by Dublin-based game designer Robin David O'Keeffe. It was funded on Kickstarter in Q4 2016. The design elements for the cards included images from old books courtesy of the British Library, as well as sketches of famous authors created by an independent illustrator. To align with the theme, I designed the box to look like a small book. This game won Best Analog Game as well as second runner-up Game of the Year at the IMIRT 2016 Game Awards. For more information on the game, please follow this link.